Ensure all control switches are off before plugging the machine to power. This includes the SPEED control dial and print POSITION to be at their left extreme positions. Do visual inspection around machine making sure there no loose parts and or objects which could hinder moving parts; if unsure call your sales representative or technician at Packit. Set the depth of the green belt depending on the size of the bags being sealed. Printing can be disabled by switching off the PRINT switch! NB: It will take between 1-1.5min for the machine to reach the set temperature depending on the days’ weather and your area altitude. The machine is ready for operation when red lights on both PRINT and HEAT temperature controllers come on. With your machine set as above, you will be able to seal any poly-clear bags of 65-85microns thick. 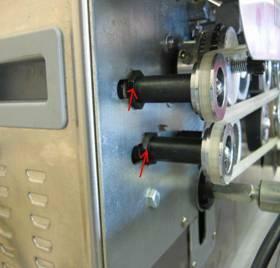 Simply align the open end of bag to the guide [L-plate on far right hand side of machine], through the first set of pulleys from guide and leave it passing through heat seal bars and pressing set of pulleys on left side of machine. Do not test seal strength at this time until sealed part of bag is fully cooled down. You will have to make the machine faster or slower if burning or poor seal is noticed. NB: Different bags material respond differently to heat so any adjustments to heat or speed should be done in small amounts! Allow product to lean on the green belt while being carried forward by Teflon belts and toothed rubber belts. Adjust inward or outward the green belt rack by unscrewing screw knobs by hand on left and right bottom part of rack to suit length of bags to be sealed. 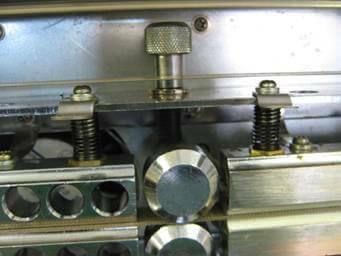 NB: Remember to tighten back screw knobs after adjustment. 1. Switch off HEAT and PRINT switches +-5minutes before cutting out power to machine completely allowing it to turn as it cool down by the cooling fan built in. Check the lock screw on connection of shaft between Green belt rack and main body of machine. Excessive outward adjustment of green belt rack. 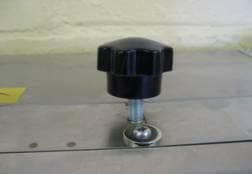 Check screws on opposing side of hinge on pulley support block; adjust inward and outward the block using these screws to align pulleys straight. 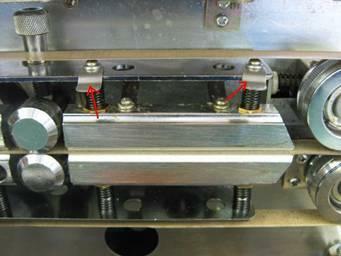 Do not over tighten screws as they are meant for adjustment purpose! Ensure that HEAT switch is put to ON position. Make sure that temperature control adjustment is adequate. Check that pressing pulleys and sealing bars are in contact. All works to machine to be conducted with machine off and unplugged from power source. Push inward the shafts and pull off both toothed belts. Push the hinged pulley support block inward to loosen tension of Teflon belts and pull them out while holding support block in. Fit in with new Teflon belts and do a reverse process to assemble everything together. Enquire about this product here or by giving us a call today!